What’s the deal on Brussels sprouts? Ever wondered why there’s a capital B for Brussels, or why Brussels anyway? Just saying, you know, sometimes how you wonder about things … wouldn’t it be easier if it was simply brussel sprout? Or sprouts if you’ve got a bunch of them? We could blame the Romans, because they were probably the first to cultivate these mini sort of cabbages, though it makes more sense to look further north towards the city of Brussels because this is where they were cultivated on a much grander scale. Simple as that. Named after the city where they became popular. Thank god no one put in an apostrophe! 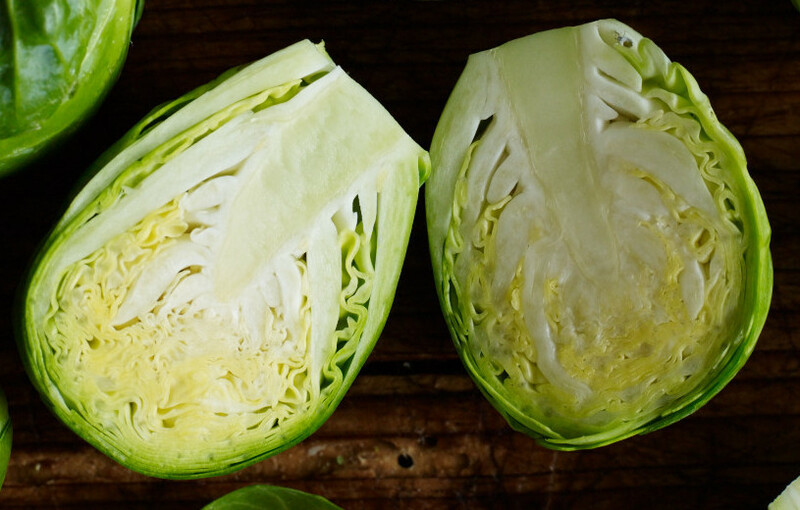 As it is with cabbage, you either love or loathe them, but what I reckon is, these days you can’t afford to ignore them because they are little buds of goodness, and in a modern fight against cancer we need all the help we can get. The outer greener leaves in particular are jam-packed with goodies, especially vitamins C and A, and they have good amounts of fibre and folate, and small but significant amounts of calcium and iron. Definitely worth eating, then. Brussels sprouts might look cuter than cabbage but they pretty well do the same thing, that is, stink the house out if you overcook them. There’s only one way to avoid this, and that is to cook them for a short period, around 5 minutes, but certainly no more than 10. If you’ve got a sharp sense of smell you will be able to detect the precise moment when the first hint of sulphur wafts out of the pot. If you’ve let them go this far, you’ve got to go for your life and get the little buggers drained, and you need to arrest the cooking process by giving them a generous splash of cold water. Getting rid of the lingering smell is not easy but try refilling the pan with fresh water, add a couple of fresh bay leaves and boil this away for several minutes. It’ll sweeten the air, hopefully enough to dispel the ponk before any invited guests arrive! Brussels sprouts are grown in two main areas in New Zealand. At the start of the season you are more likely to be buying sprouts from Ohakune. These tightly packed little buds are crisp and slightly nutty tasting with a subtle mustardy piquant bite. Oamaru is the next big sprouts area, producing larger ones with a looser leaf formation. The mustardy tang is not so noticeable, and these sprouts generally taste sweeter than early season varieties, and nutty, too. But wherever you are buying Brussels sprouts, all varieties are better for a little bite of frost – that’s when they are at their crispest best and really start tasting good. Look for green, compact Brussels sprouts, avoiding any with yellowing leaves, or any that are soft or floppy. Choose them of an even size so that they cook evenly, then store them in an open-ended plastic bag in the refrigerator, but use as soon after purchase as possible. It’s something that is not often discussed – you know, people like me giving out all these messages about how good vegetables are for us, full of this, that and the other, when really it only pertains to FRESH produce. After cooking sprouts, drain well, refresh with cold water to stop the cooking, drain again and shake vigorously in a colander to free them of excess water. Mop dry with paper towels if you are going to sizzle them up. Overcooked Brussels sprouts are hopefully a thing of the past, but one of the old kitchen tips – cutting a cross on the base of the sprout – does serve a purpose. It allows boiling water to enter the base of the sprout, the densest part, ensuring it cooks through at the same time as the leaves. This is a good tip for more mature sprouts which can become soggy on the outside before the centre is tender, and for very dense sprouts with tightly furled leaves. Brussels sprouts will keep a better colour if cooked by plunging them into gently boiling water, (rather than putting in a pot with cold water and slowly bringing the water up to the boil), and cooking without a lid. If a lid is put on the pan, chlorophyll and acids in the vegetable can’t escape in the steam, and instead collect on the lid and fall back onto the sprouts causing discolouration. Err, no, we don’t want that! If you happen upon some gorgeously mint-fresh baby buds, you can eat them raw (do NOT try the following with mature specimens!). Slice finely and mix with orange segments and dress with a mustardy vinaigrette, strew with fresh thyme and away you go. Great with roast chicken, pork or beef. Or add this mix to a big mixed salad platter. Fresh walnuts are a great addition, or toss with a little sesame oil, fresh bean sprouts and cashew nuts. Or walnut or lemon oil. There’s heaps of scope. If you’ve got bigger babies, still nice and fresh, though, but slightly larger, they are ideal to serve separated into individual leaves. They’re fabulous like this and you’ll convert any Bs-hater I bet. Blanch briefly, drain, refresh, cool and dry off, then reheat in a little butter or oil in a large wok or frying pan, adding freshly grated nutmeg, or chopped herbs, or crushed garlic and black pepper … the leaves stay crisp and green and are deliciously nutty to eat. This method is not recommended for tight little buds, or you’ll be cursing because they are so hard to separate. 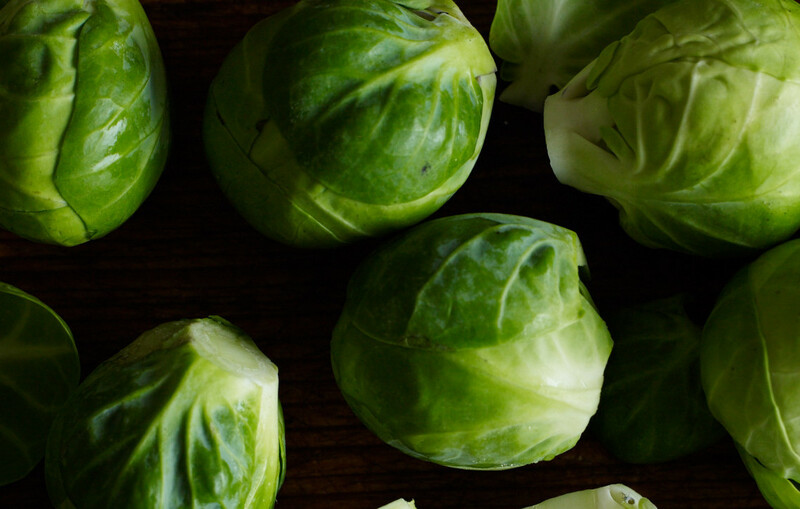 Brussels sprouts love some form of fat (don’t we all, well, if you’re a real food-lover!). Try the following ‘non’ low-fat but delicious ideas. Toss cooked, drained spouts in sizzling butter and add plenty of black pepper and freshly grated nutmeg. Very simple, but it improves them three-fold. Toss hot Brussels sprouts with a little knob of butter and a good handful of freshly grated parmesan cheese and serve hot. Again, simple, but it adds so much flavour. Take this a step further and add garlic to the butter, nutmeg and black pepper if liked, then toss with grated parmesan (use olive oil in place of butter if preferred). Sizzle bacon in its own fat until it runs and the bacon crisps. Mmmm. This is already going somewhere good! Drain off excess fat, then add Brussels sprouts, whole, halved or quartered, and cook a minute until hot. You can sizzle them until golden if you like. Or toss cooked and drained sprouts with a knob of sizzling butter and a handful of pine nuts or slivered almonds. Grind over plenty of black pepper and serve a lemon on the side for squeezing over. Trim 500g (about 1 pound) Brussels sprouts, removing any damaged leaves. Cut a cross in the base of each. Wash well then plunge into a saucepan of gently boiling lightly salted water and cook uncovered for 6-8 minutes, or until crunch-tender. Drain and refresh with plenty of cold water, shake well and leave until dry. Put 150ml (a generous ½ cup) cream in a saucepan and reduce by half. Add plenty of black pepper and freshly grated nutmeg and the grated zest of a lemon. Toss in the sprouts, then serve immediately. If you like, add chopped parsley, snipped chives or a touch of finely chopped rosemary. Gently sizzle a chopped onion and a couple of cloves of garlic in 3 tablespoons olive oil until golden. Add 400g (14 ounces) mashed/crushed canned tomatoes, then cook uncovered for 15 minutes. Season with salt, pepper and 1 teaspoon chopped marjoram or oregano. Prepare, cook, refresh and drain 500g (about 1 pound) Brussels sprouts. Get all this done ahead. Just before serving, cut Brussels sprouts into quarters and reheat the sauce. Add sprouts to sauce, stir well and heat through gently until piping hot; do not cook them any further. Transfer to a heated dish and sprinkle over ¾ cup breadcrumbs previously fried in a large knob of butter or 2 tablespoons olive oil until crisp. Great with a winter roast chicken dinner.